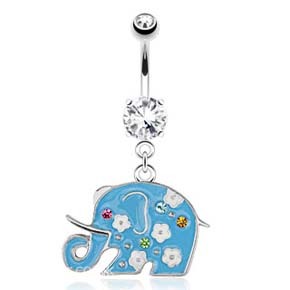 Dangle belly bar with a cute blue elephant on a 10mm (3/8") clear double jewelled surgical steel barbell. The sweet little elephant has tiny white flowers over his body, and the blue enamel design measures 20mm x 18mm. The surgical steel barbell also has a 5mm clear gem top ball. The best eCommerce software by ShopFactory powers P12469. All-in one eCommerce and shopping cart software.